Community involvement and homeownership at Highland Lakes has its rewards and since we have a clubhouse to host parties and events, we really go to town. Any resident in good standing can rent the clubhouse for their own personal event, but we also host community-wide gatherings that cover almost every major holiday. Clubhouse and other property events are basically a junction where three committees can realistically become involved. Depending on the type of party and location, it may be hosted by the Clubhouse Committee, Pool Committee or Community Social Committee. Parties may be centered around childrens' activities, such as crafts, tree decroating and Easter Egg hunts. Others are adult parties such as the pool parties, the Christmas Party, or even luncheons or book sales. 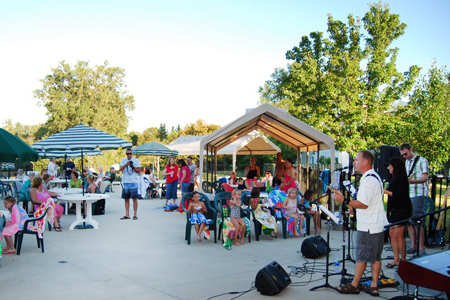 Some of the parties hosted at the clubhouse include the New Years Eve celebration, Valentines Day Party, Easter Egg Hunt and Party, Pool Opening Ceremony, 4th of July Celebration, Pool Closing Party, Thanksgiving Day Party and Christmas Party. A few of the committees also host their own gatherings for either members only or all residents to attend, so it is not uncommon at Highland Lakes to see the kitchen actively serving meals or to see the barbeque going on the patio outside. If you are a family with children, they will enjoy story telling with the Easter bunny, craft shows and three Christmas trees in December, one of which is theirs to decorate with ornaments made at the clubhouse. For information about renting the clubhouse, see the Clubhouse Committee page, otherwise, the scheduling of Community Social events and dates of parties is listed on the calendar at the clubhouse, or may be obtained from the office staff.